The small island nation of Vanuatu was devastated by the cyclone. The ABC reports that there is not a single school left undamaged. There will be few buildings anywhere that will have not been damaged. So far there have been 28 deaths reported, and the death toll may well rise as more reports come in from isolated places. You can read the rest of the article here (h/t PG). Marke commented that the numbers of humanitarian emergencies are not the best metric. Unfortunately there are not as many observations of incidents where no-one lives. Anyway, I've done the next best thing and dug out the latest data from Munich Re. It is of loss events. This is not the same as insured losses - it includes all events that "either resulted in direct property damage and/or at least one fatality". And it's a number, not a dollar value. Last year, there were a "record number of almost 1,000 catastrophe events". The growth was mostly hydrological (flood, mass movement) - not geophysical (earthquakes, volcanoes, tsunamis). The report is available here, but you'll need to register (it's free). I've written before about other reports on weather and climate related disasters. After the hottest year on record (2014) and the second hottest January on record, the world has just had the second hottest February on record. It's also just had the second hottest summer/winter on record (DJF). Even though there was a WUWT article (from tedious Bob Tisdale) reporting the latest monthly temperature data, neither of those points rated a mention, not surprisingly. Australia also had the second hottest February after 1983. It also had a couple of cyclones, including Olwyn in WA which caused a lot of damage in and around Carnarvon. Assessments report this year's banana planting was totally ruined, along with the avocados. There's not been a lot of talk at WUWT about the records being broken in the USA, either. At Weather Underground, Jeff Masters and Bob Henson have written about a very warm spell in the west. You'd think that Anthony Watts lived in Timbuktu for all the attention he gives his home state. And you'd never know that he used to be a weather announcer. 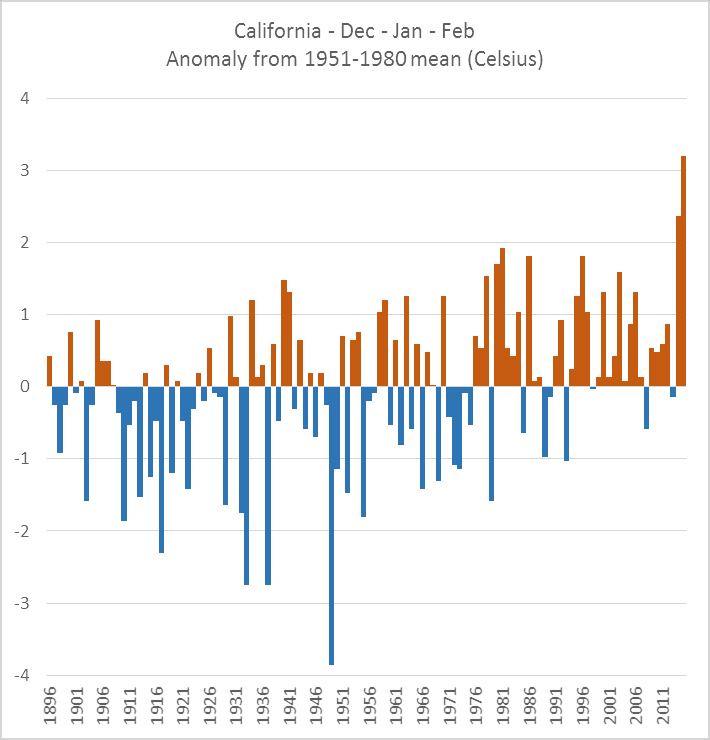 California has had two remarkably hot winters. If you thought that the last winter in California was extraordinary (it was), then you'll have run out of superlatives to describe this latest winter. So if the warming world isn't of interest to deniers, then what is? They are still stuck in denial, from the look of things. These are frightening words and a disturbingly narrow position from one of the most powerful statesmen and diplomats, in the world. Yep, Tim wants John Kerry to waste his time meeting the Flat Earth Society. Because linear equations and relationships are proportional, they make a line when graphed. Kip drew lots of straight line graphs. I think he also equated non-linearity with chaos. This article was apparently one in a series he's working on, leading up to an article about non-linear systems and chaos. I bet you just can't wait. "Chaos does not exist in the real world because the real world has no initial conditions to which it might be sensitive. " A lot of people seemed to be confused about the difference between weather and climate, particularly the virtual impossibility of predicting weather beyond a few days. Many of them seemed to think this means that it is pointless to try to work out changes in climate. They are probably wondering how much snow will fall this summer, or how many heat waves will occur come winter time. This was a catch up article. I've been busy elsewhere and missed out on a few things in denierland. Not that there was anything startling to report. Mostly just the same denial as usual. Here in the lovely San Francisco Bay Area, we've been enjoying the relatively mild winter and I have been mightily resisting the urge to make much ado about it lest I succumb to conflating weather and climate. But that DJF anomaly graph for the whole state is pretty hard to ignore, not just for blasting right past the all-time instrumental record which had only been set last winter, but for the long-term trend within which only an inveterate cherry-picker could find a flat spot and call it meaningful. A good friend of mine is fond of noting that the fog is burning off earlier in the day than it did in his youth. I am fond of teasing him for his confirmation bias. Imagine my surprise when I happened across a paper cited over at Willard's which confirmed my friend's anecdotal observations over the decades. The WHUTTers are occasionally good for something I s'pose. On the conflation issue, note: just as it's true that climate is not responsible for any single weather event, it's also true that no weather event is uninfluenced by climate. Trenberth has noted this on a number of occasions. Indeed. And I note in Trenberth's comments about the NE US blizzards this winter, he gave the press a quantified estimate of how much AGW contributed to those storms in terms of moisture relative to a climatological mean. By and large, the WHUTTers consider such nuance to be nit-picking or hair-splitting -- something that drives me to endless distraction when I recall all the (continuing) hoopla over Yamal. "You'd think that Anthony Watts lived in Timbuktu for all the attention he gives his home state. And you'd never know that he used to be a weather announcer." Let's make Anthony Watts announce the weather in California for eternity as his punishment in Hell. Whatever you do Tisdale don't mention CA. I mentioned it once but I think I got away with it. Thankfully I've got dbS to remind me. Its quite possible that one of dbS's sockpuppets comes from Barcelona. Has Pielke Jr weighed in yet? Doesn't this contradict his insistence that climate change doesn't affect extreme disasters? Jr has unfriended climate. Please refer all enquiries to Curry J.
Jr unfriended climate because climate wouldn't play nicely with his ideology. Ideology might be a bully, but like all bullies in capitulates* in the face of inevitable and implacable greater strength. *When I said "capitulate", I was going to say "fold like a rotten deckchair at an origami class", but is has to be said that some deniers are too stupid to recognise when they're defeated. The 'honest broker' would really like to move on, but is finding it somewhat difficult. "After the hottest year on record (2014) and the second hottest January on record, the world has just had the second hottest February on record. It's also just had the second hottest summer/winter on record (DJF)." Last 12 months were the warmest consecutive 12 months in the GISS record too, if it hasn't already been pointed out. Surely a lousy metric: Humanitarian disasters. More people, and wealthier people, building many more structures, and more expensive higher tech structures, in more places, and in more vulnerable places. Perhaps a metric focusing on the physical records of the events themselves may get the message across more clearly and convincingly. Marke, thanks for the prompt - I've added an addendum with number of events from Munich Re. There's also an article I wrote last October. This all reminds me of the MIT students that took on the Casinos with a mathematical advantage to win at Blackjack. The casinos knew that there was a problem with card counters. When this group of students started betting big they were showered with freebies. When they kept winning big, they got 'investigated'. This then led to intimidation and expulsion from all the worlds casinos. They should have got out before they were spotted. Just because you are totally correct does not make it valid in our distorted Universe! Hey, this might be a good idea! Is here f.e. any spectroscopy on WUWT? Of course there's a profound lack of links to research articles, but that's just to be expected. What basic science is missing from the site? This might even be a competition among the WUWT- debuggers (likely a job with no end)! What's not at WUWT? The Watts et al 2012 game-changing paper in its final form. The link to the "work page" that "has been established for Watts et al 2012 for the purpose of managing updates." leads nowhere. Methinks Watts et al 2012 has gone beyond an event horizon and it will never be seen again. I presume that it was archived for giggles? Oh there might be some announcement of 'game changing' results to coincide with the next climate talks, all to disappear into oblivion shortly after the talks fail to deliver anything anyway. If not that, I guess the hackers are trying right now to steal some emails that can be misrepresented. Anything pertaining to the election of the Board of Directors of the Open Atmospheric Society, the formation of a membership committee and the appointment of an editor of their Journal (all of which were due before 1/1/2015), or any indication of the publication date of the inaugural edition of said journal. Not that I was holding my breath, mind.